These two Alpha Sixes are being retired tomorrow morning in favour of SON casual replacements. The two closest Alpha Sixes were replaced by SGS203s. The last remaining Alpha Six was lit, although the GR150 was out. The final Alpha Six in this photo will go when the rest of this stretch of dual carriageway is converted to SGS203s*. This one used to be outside Marks Tey Railway station. High side winds stress the metal bar which goes across the top of the lantern, causing it to snap where it joins the shoe. Just to say that this lantern is still very much alive and well and has not come to any harm! I passed by that road last night and discovered it was the second Alpha Six along the road that had failed (this one is the first one). The broken Alpha Six was on a sleeved concrete, and can be seen in its unbroken state at the very back of the photo below. The good news is there are still a number of Alpha Sixes running in Colchester, perhaps fifteen or so, with about half under the control of Essex County Council and half under the control of the Highways Agency. At least half of them can be found on the assortment of roads, slip roads, dual carriageways and roundabouts of Junction 25 of the A12. * Thankfully Colchester still favours the SGS203 over the Iridium, but I don't know how long that will last as I though the SGS203 was about to be, or had been, discontinued. And Essex and Herts are still keeping the SRS201 in production of course! Last edited by David on Mon Oct 09, 2017 1:17 pm, edited 4 times in total. How do you know those Alpha 6s in the top picture are being replaced tomorrow? Have you had a tip off from your contact? Reading are still fitting new SGS203s and Wiltshire used some a year ago so looks like they are still "available" or there are stocks on shelves. Gutted about the three Alpha 6s being replaced, and a bit depressing that the S&L columned one has broken off at the shoe. It shows now that they will start to fail, probably quite quickly. I hope Alpha 6s that can be saved, are saved. Are you sure the SGS 203 is discontinued? It is still listed on the Philips website. Yes, he replaced the 50w bulb in the SGS203 outside my home today, and when I spotted him I went down and had a chat! I hope Alpha 6s that can be saved, are saved. I think they'll need luck on their sides as they are really old and definitely showing their age. 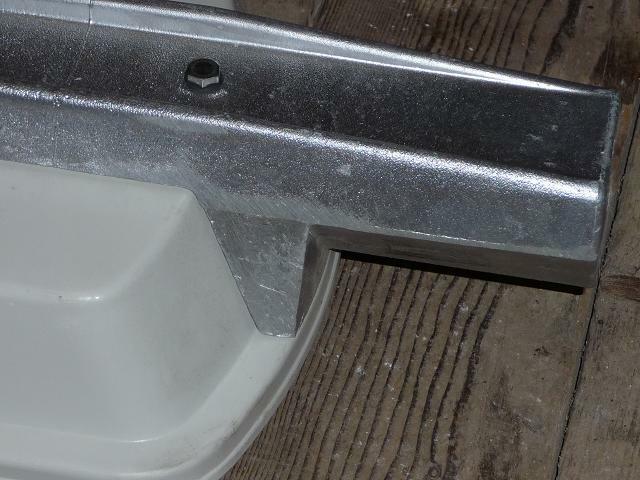 I expect the weak join between the shoe and the GRP won't take too kindly to being hammered off the bracket if the grub screws have siezed, especially considering how fragile they are in strong winds. I'll find out how it went later in the week. Are you sure the SGS 203 is discontinued? This may be a piece of anticipation and guesswork from me, as the '203's bigger brother the '204 (another popular Colchester lantern) is no longer being made. I guess there's no reason why Philips can't continue to sell three SON main road lanterns (the '203, the TrafficVision and the Iridium ... there might even be another I don't know about!). After all the Thorn Alpha One, Alpha Four and Alpha Nine probably overlapped for quite a while. Of the three I would still expect the '203 to be discontinued first, and quite soon considering the popularity of the Iridium, with the TrafficVision following next and the Iridium ruling as king of the road. If the '203 isn't being discontinued sometime soon, it will certainly be good news for my contact - he likes the easy-swap gear trays on the '203, and detests the new control gear in the Iridium. Although the gear tray in the Iridium can be removed in a "few clicks" as it is a snap fit, it is right pain to change individual components. This can only be done if the tray is removed first. On the SGS203 as you mention, everything is more easily accessible. It is a bit worrying that Iridiums are needing "gear attention" already. Looking at my Alpha 6, there is a ridge in the casting just outboard of the shoe on the "spine". It looks like this was a join in the casting mould. I wonder if this is the weak point that stress fractures start from? Alternatively there is a fairly sharp radius where the shoe follows the contour of the edge of the canopy at the rear - this looks like another potential failure mode where cracks may start. There are also only 2 bolts of approx 6mm in diameter which attach the canopy to the spine - I wonder if these corrode and eventually fail causing the canopy to detach from the spine? It is a bit worrying that Iridiums are needing "gear attention" already. Apparently the Iridiums are fitted with a new type of gear - none of it makes sense to me I'm afraid, something to do with magnetic and electronic? - and the newer gear in the Iridium seems to cause my contact far more trouble than the '203's. I don't know whether the newer type of gear does fail more frequently than the old type, or whether the guy just finds swopping out the failed components far easier in a '203. ...there is a ridge in the casting just outboard of the shoe on the "spine". It looks like this was a join in the casting mould. I wonder if this is the weak point that stress fractures start from? Alternatively there is a fairly sharp radius where the shoe follows the contour of the edge of the canopy at the rear - this looks like another potential failure mode where cracks may start. I think the failure point is the sharp radius between the shoe and the spine, as the shoe always remains on the column bracket (like a failed Alpha One) whereas the spine is never anywhere to be seen! Last edited by David on Mon Oct 09, 2017 1:20 pm, edited 2 times in total. Ah, the electronic gear in the Iridium is unreliable then? Electronic gear is smaller, lighter and more efficient than "traditional" magnetic gear but it seems not to be very reliable. At my local lighting depot, the skip is full of duff electronic gear. If the grubs are siezed he will probably just disc cut the spigot tube - hammering off doesn't always work anyway. It looks like the Alpha 6 spine fails at the corner where the shoe follows the canopy contour (top edge of canopy) and across to the bolt hole - see below. I bet a stress crack propagates vertically from the corner completely separating the spigot socket from the spine. The up and down oscillation of the lantern in the wind probably causes the fatigue. I guess Thorn didn't carry out 30 years of waggle tests! However, they could have always done what is done in the aircraft industry for fatigue testing and used accelerated cycles to highlight the problem. It still goes down as one of my favourite lit junctions; such childhood memories! I would love to be able to see the Alpha 6s warming up with their mauve (as opposed to red) glow. Anyway back on topic I wish you for tomorrow; I really hope you manage to save some. How many Alpha 6s can be saved david? I think the SGS 204 has been discontinued for some time now, about 5 years. I guess that finished it off is that most councils just used the SGS203s rather than both (Wiltshire, Glocestershire, NE Somerset - although Bath does have a few SGS204s). I think there wasn't any need for the SGS 204 in the end because the SGS 203 covers up to 250w SON but TrafficVisions tended to get used for motorways for the larger wattages in the end. I think the SGS 204 was OK but not very compact like its little brother or cousins. However it wouldn't surprise me if the Streetfighter range was discontinued next. Most councils that have a strict budget tend to go for the SGS201. Regarding the SRS201s, I don't think Philips could face the outrage of discontinuing the only 135w and 180w SOX lanterns pretty much available now [and maybe 90w as well]. I think Thorn got out at the right moment with their Alpha 4 - Meaning Philips would be forced to keep them in production. Good luck regarding the Alpha 6s tomorrow!